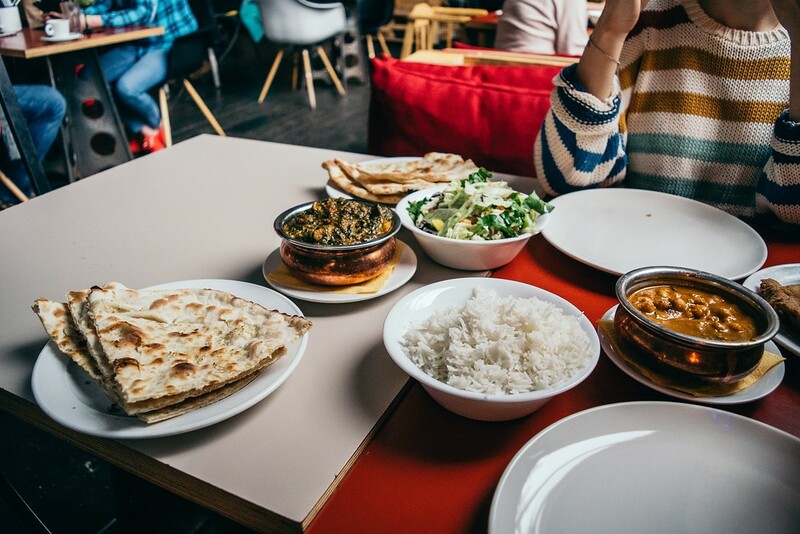 While going vegan in India is a growing movement, vegan travelers still face some challenges. It’s no secret that vegetarianism is popular in India. In fact, you’ll find the world’s first vegetarian city in India, where it’s illegal to slaughter animals or sell meat and eggs. However, there are still many challenges for vegetarian and vegan travelers visiting India. For instance, the notion that most Indians are vegetarian is a myth. Only about three in ten Indians label themselves as vegetarian. Furthermore, India has an extremely high dairy consumption rate, meaning that it can be trickier to find purely vegan eats. How is the vegan movement growing in India? What are some challenges a vegan traveler might face in India? 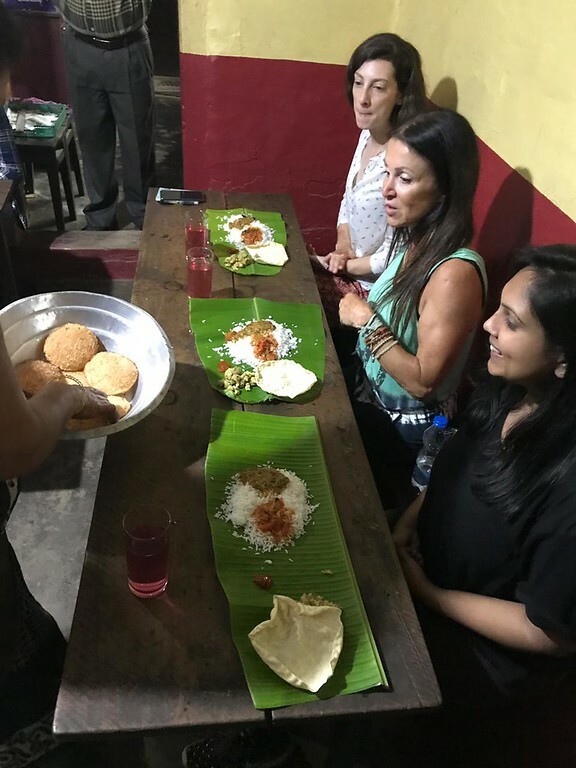 What kinds of food will we eat on our vegan tour to India? Beyond eating delicious food, what kinds of things will a traveler experience on our vegan trip? What made you want to start a travel company focused on vegan and sustainable travel? What makes your trips different from other tourism companies in India? How does your tour company combat over-tourism and support sustainable enterprises? How are your tours ideal for the first time traveler to India (and the repeat visitor)? In what ways are your tours eco-friendly? What’s the best way to contact you to ask questions or book the trip? Should you travel to India if you follow a vegan diet? Absolutely! You can certainly find vegan food in India. If you’re looking to travel as a vegan in India, you should consider joining me on a vegan India adventure trip in September 2019. 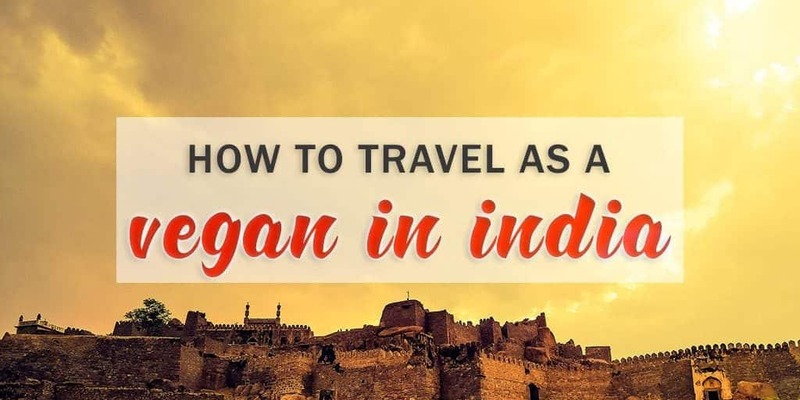 You’ll be joined by myself and vegan India travel expert, Prachi Jain of Escape To… by Fairkonnect. 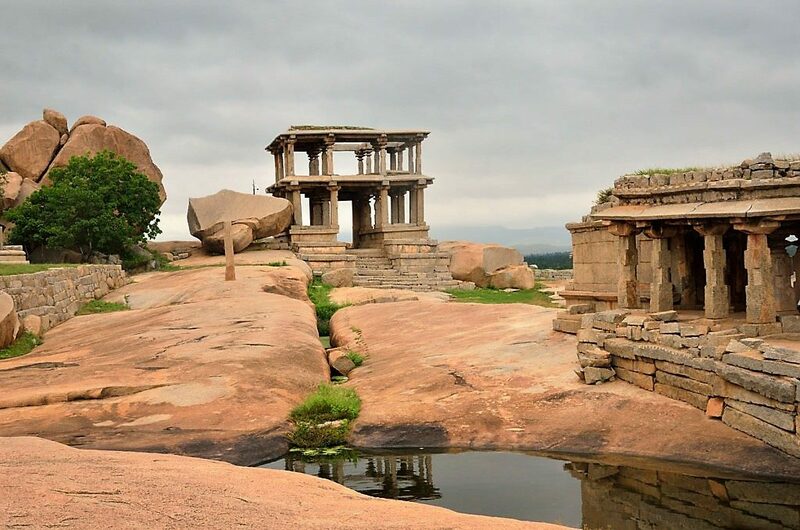 Prachi has kindly answered some questions that I had about vegan India travel, sustainable tourism in India, ecotourism in India, and her tourism companies in India. 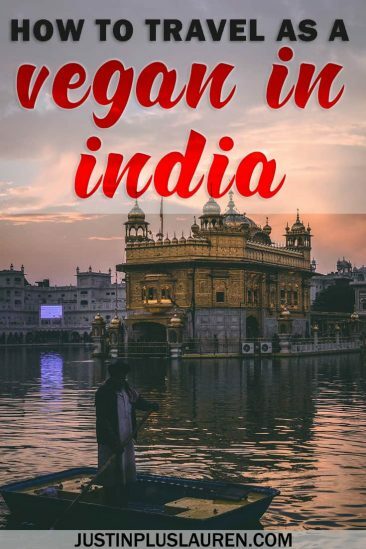 You’ll learn more about the vegan movement in the country, how our tour will support sustainable enterprises, how to combat over-tourism, and how her trips are perfect for both the first time visitor and seasoned traveler to India. Want to join us? 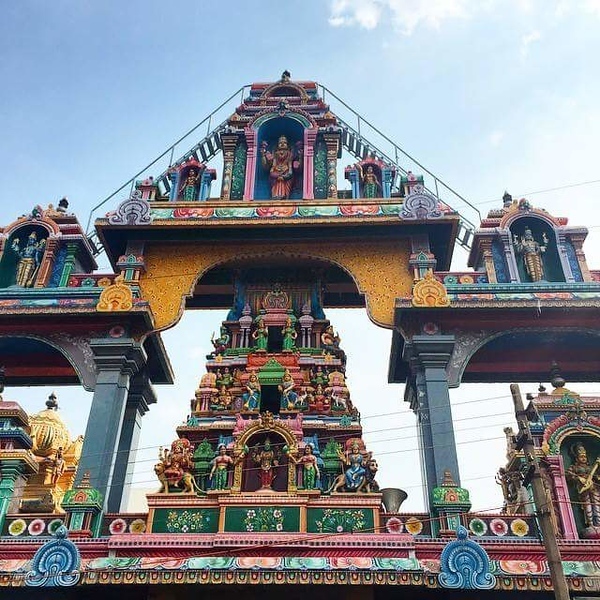 Here’s how you can travel to India with me in September 2019! Click here for all of the details! There is a lot of growth in the vegan movement in India, especially in the cities like Bengaluru, Mumbai, Goa and Pondicherry. What seemed like a fringe movement a decade ago is now moving into the mainstream. Vegan start-ups have worked really hard, and there are many vegan home makers who are catering meals. It’s really awesome to see India focused on dishes that are unique to its culture and traditions instead of only focusing on mock meats. Folks are turning vegan as they see the health benefits. As a country with one of the highest rates of dairy consumption, Indians are starting to realize that the dairy they are consuming is laced with chemicals and hormones. Avoiding dairy also means avoiding a lot of sugar, which is important for a nation impacted by some of the highest rates of diabetes. I have found North India to be a bit more challenging than South India as a vegan in India. It’s important to always ask if the dish has ghee (clarified butter), regular butter, milk or milk cream or yogurt in it. However, a recipe that you may have had in one restaurant can be totally vegan and at another restaurant, they might add ghee to it. When I first turned vegan, it was really hard for me to resist chai because it is delicious and there are really cheap stalls all over the country selling chai for 10 rupees (which is like 10 cents). As a vegan traveler, it’s always good to be prepared so you can still enjoy all the local food and drink. 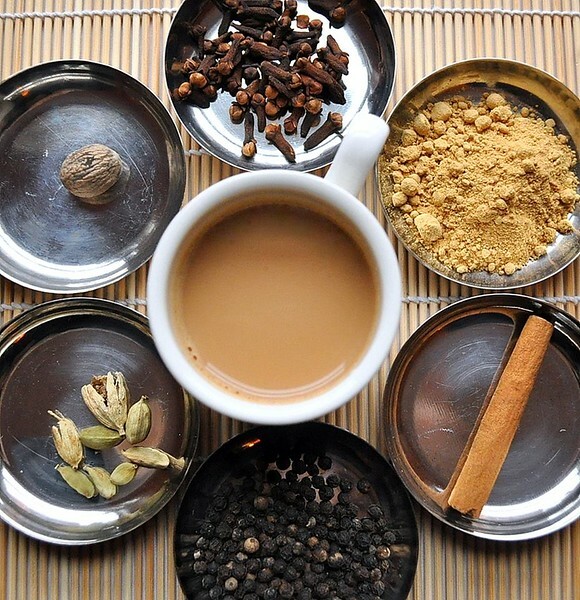 You can go to many chai stalls and ask for the masala tea without milk and then just add in your own vegan milk if you are carrying a small pack of it. I suggest always asking the restaurant to not cook your food in ghee or add butter, milk or yogurt. Use Google Translate to make sure you repeat it a few times in different ways. When in doubt, go to an Indo-Chinese restaurant and have veggie momos, gobi manchurian and veggie fried rice. Those are never cooked with dairy products. If you order a thali, ask them to hold the yogurt and any dessert dish with milk. So many! Honestly, India is a colorful mosaic of cultures and we want to share that on the trip through food. We’ll be tasting local Karnataka food (like akki roti) which many people probably have not tasted outside of India. We’re going to try vegan versions of Indian favorites like palak paneer (made of tofu) and payasam made of coconut milk. Since we’re traveling to the South India, we can expect a lot of dishes to contain ragi which is an ancient grain of South India and coconut milk and cream. We’ll also try some modern vegan cuisine – my favorite is a creamy broccoli soup done by one of my favorite vegan restaurants in the city. Lastly, I can’t wait for people to try some of my favorite drinks with alternative dairy options like buttermilk with savory spices and pink chai with saffron. From my experience with past vegan tours, we will eat almost nonstop. We really want people to come away with a feeling that they’ve traveled and tread lightly in India after the trip is over. That means that we’re going to experience elements of zero-waste travel, slow travel in which you are not jumping from one city to the next but really soaking in one place at a time (we don’t actually cover a large geographical area in 10 days), meeting local change-makers and feeling more connected to the vegan startup movement around the world. Also, apart from this…we are going to travel to one of the most unique places on Earth. It feels like you are on a completely different planet when you first get there. So from a travel standpoint, we’ll see two very different kinds of India – urban and cosmopolitan to rural and ancient. I started our company back in 2010. 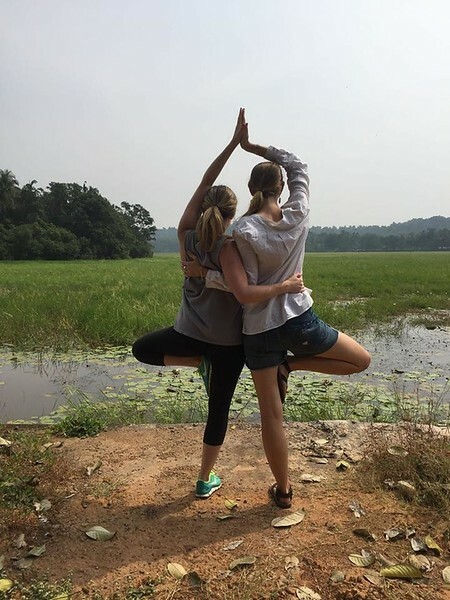 We started hosting international volunteers and interns who wanted to live in India and do meaningful work on a long-term basis. My goal is to make it easier and safer for travelers to experience India, while learning from amazing initiatives by local Indians. I always encourage my travelers to not eat meat or dairy in India due to health reasons (avoiding food poisoning). I was really compelled to make this shift after attending the Responsible Tourism Summit in New Delhi. Tourism is contributing to wildlife endangerment, plastic and waste pollution, and over-tourism. 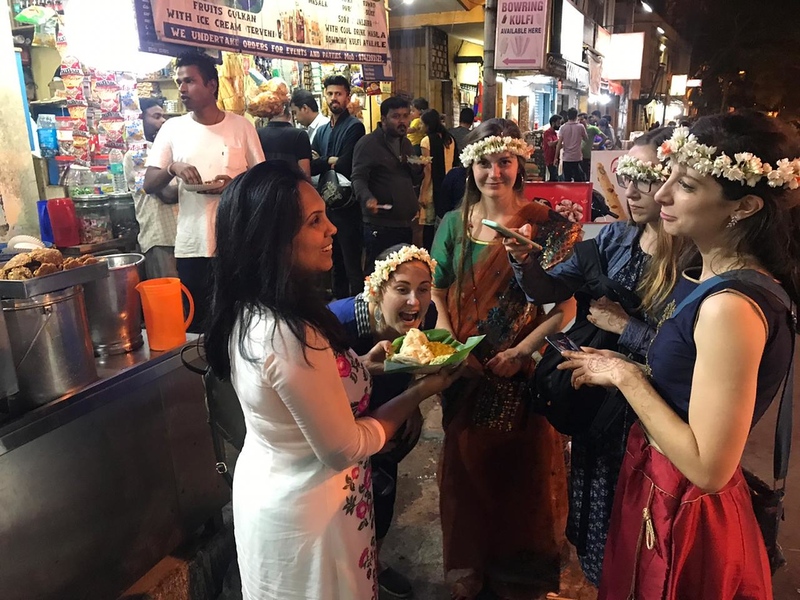 As I started learning about how tourism can be a force for good in the world, I became much more intentional in the experiences we offered in India. 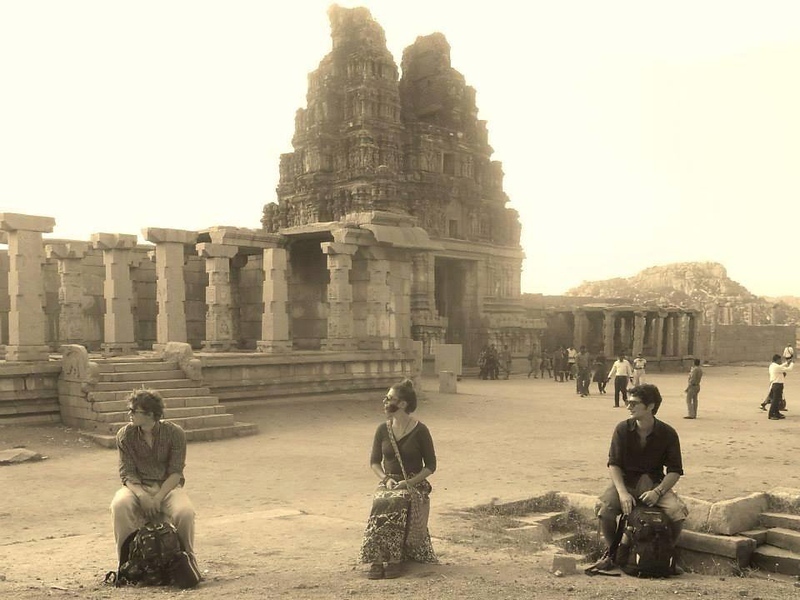 It wasn’t enough for us to just say that travelers could come and experience Indian culture. We are committed to making sure that no animals are harmed. This means no elephant/camel rides, no consumption of animal products, and not buying clothing and souvenirs made of animals. We are as plastic-free and zero-waste as possible as we travel. Furthermore, we’ll help grow the vegan movement in the places we visit. With many tour companies wanting to do good, I decided that experiencing local culture wasn’t enough. We had to inherently change the way people travel from what they eat and drink to how they shop and what businesses they support while they are on the trips. Ultimately, I think this is not just the way I particularly like to travel, but how I like to live everyday. I wanted to translate my own lifestyle into an interesting travel experience that benefits everyone. We are not a typical tour company, and this sets us apart from other tourism companies in India. 365 days of the year, we host international volunteers and interns who stay with us in India for 2 weeks to 6 months. We design an experience that is beyond the surface level of typical tourist activities. Our own clients tell us secrets and gems that they’ve discovered while living in India with us for 6 months. So, when we do actually host group trips (usually no more than 5 times a year), we offer experiences that are only possible after living in India for quite some time. This could mean the most ordinary of things that locals do. It might be riding a bus and going shopping for fruits. It could also be attending a panel discussion put on by local startups. Also, we showcase all of India from the very under-resourced to the very luxurious. Some people want experiences of India that only show them what they have already seen – slum tours, underprivileged schools, etc. However, India is also a nation of entrepreneurial energy, art and fashion, and incredible amounts of innovation across all industries. We hope our travelers see all facets of the country. You’ll leave knowing that India is a much more diverse and complex country that can’t be summed up in only 10 days. We are really conscious of over-tourism and always create an itinerary that doesn’t always include the most popular places or the sort of “Instagram-famous” places. I’ve recently found out that some travelers want to visit places simply because they saw an Instagram influencer visit there once. We try to educate our travelers about the significance of visiting a particular place that we’ve chosen to be on the itinerary. We don’t always pick the places that are the prettiest to photograph. Instead of only sightseeing, we do a lot of workshops on our trips. We help our travelers meet local entrepreneurs in the vegan field to forge meaningful connections. Hopefully, they’ll bring those ideas back with them when they go home. 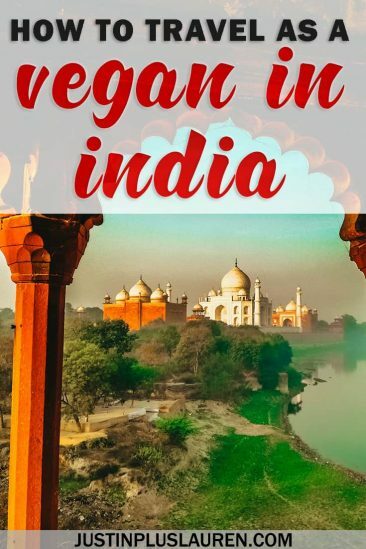 If we do have something more tourist oriented on the trip (for example, the Taj Mahal) we offset that by going to a place around it that supports some kind of sustainable initiative in veganism or fair trade. We give advice to our travelers about where it would be most helpful and meaningful to shop. We offer a really great taste of what makes up India. The old, ancient and unchanging to the new, energetic and innovative spirit. You are usually traveling in a small group of 8-12 people. This allows for some incredible bonds with people from around the world. For those that have visited India before, it will almost feel like you are going one step beyond the surface of what your first trip may have been like. It’s like getting in a little deeper into the spirit, past and future of the country. We try to limit our plastic water bottle usage so that we are filling up water bottles at our hotels rather than constantly buying them outside. We ask travelers to bring their own toiletries instead of using ones from the hotel that may be packaged in plastic. Sometimes we eat with our hands in the Indian way, and we provide silver utensils and metal straws so that we are not using plastic cutlery. We try our best to use public transportation like metros whenever possible. For clothing and souvenirs, we suggest places that our travelers can buy sustainable materials (for example, scarves with natural dyes, upcycled accessories, non-plastic souvenirs, etc.). Please send me a message directly. I’d love to discuss more about the trip, answer any questions or hash out any ideas. Side note: Feel free to also contact me (Lauren) if you have any questions, too! Thank you so much, Prachi, for talking about such important issues of vegan travel, ecotourism, over-tourism, and sustainability. We should definitely consider these issues in all of our trips as we travel around the world. There are so many ecotourism places in India that you can visit. Traveling on an eco-friendly tour that’s carefully planned by a local is the easiest way to ensure that you’re contributing positively as a traveler. I’ll be traveling to India with Prachi and Escape To… from September 21st – October 1st, 2019. 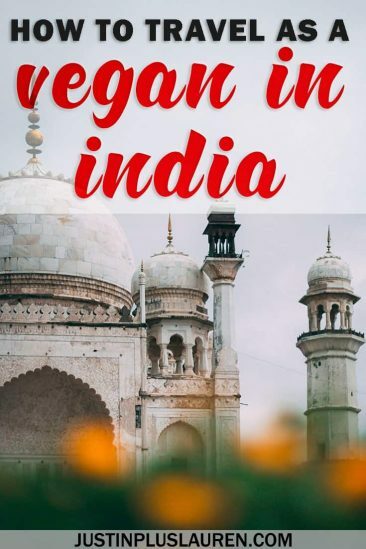 I’d love if you could join us on this vegan adventure in India. You don’t need to be vegan to join. Come with an open mind and an appetite for delicious local cuisine. However, if you are vegan, you’ll be guaranteed to have no issues finding plant-based meals in India. We’ll be eating them nonstop. For more details on the itinerary and booking information, please check out the official website. PIN one of the above images to Pinterest to save this article for future reference. Do you have any questions about traveling as a vegan in India? Comment below!